The eye of Hurricane Maria swept through Puerto Rico yesterday, lashing the US territory with Category 4 winds of 155 mph (200 km/h) and knocking out power across the entire island. 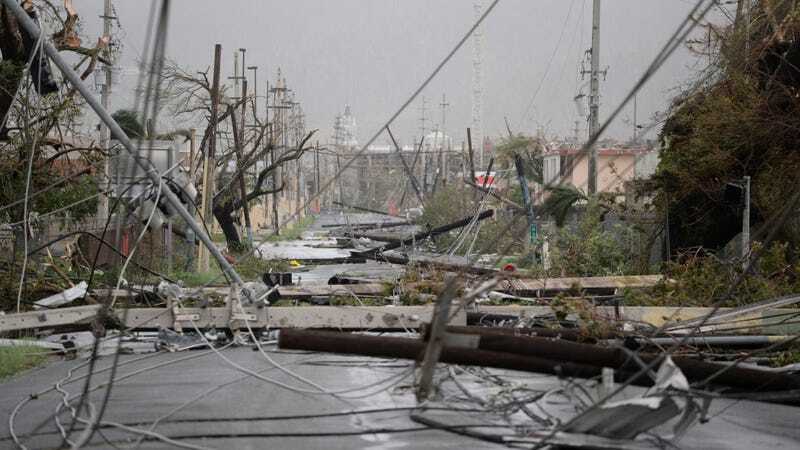 “Months and months and months and months are going to pass before we can recover from this,” Felix Delgado, mayor of the northern coastal city of Catano, told The Associated Press. He’s not exaggerating. Puerto Rico is a battered vestige of what it was just a few hours ago, with vegetation stripped from trees, hundreds of houses smashed to tinder sticks, and streets filled with the flotsam and jetsam left behind by catastrophic floods. Earlier, the storm blasted through the US Virgin Islands, passing west of St. Croix and delivering winds as high as 90 mph (145 km/h). Puerto remains under a flash flood warning on Thursday as the tail-end of the storm threatens to deliver another four to eight inches of rain on top of the 35 inches already delivered. At least one person is dead, and a woman and two children were rescued from a boat that went missing off Puerto Rico, according to the US Coast Guard. Maria is being blamed for at least 18 deaths so far: 15 in Dominica, two in Guadeloupe, and one in Puerto Rico. The hurricane couldn’t have come at a worse time for the US territory, which is in the midst of a debilitating debt crisis. With an infrastructure in an already depleted state, there’s no way of knowing how long it’ll take Puerto Rico to bounce back from Maria, or where it’ll get the resources to do it. “Puerto Rico is in very, very tough shape. Their electrical grid is destroyed. It wasn’t in good shape to start off with, but their electrical grid is totally destroyed,” said President Donald Trump today before a UN meeting with Ukrainian President Petro Poroshenko. Trump said he’ll work with the island’s governor, Ricardo Rosselló, and said he’ll visit the “absolutely obliterated” island at some point in the future, though no date was specified. In the US Virgin Islands, home to about 110,000 people, the situation was just as desperate. The White House, as it did for Puerto Rico, has declared the islands a disaster area to make room for federal funding. The storm knocked out electricity and most mobile phone services across the US Virgin Islands. Most radio stations are down and many roads remain impassable, according to Reuters. Estimates suggest about 70 percent of buildings were damaged in St. Croix, a city with a population of 55,000. The National Hurricane Center reports that Maria is currently 135 miles (215 km) southeast of Grand Turk Island. It may strengthen in the coming days, but it’s unlikely to hit the US mainland. Tropical storm winds could start hitting the central Bahamas beginning late Friday. And there are still seven weeks left in this year’s Atlantic hurricane season.